Savannah is considered one of the most haunted cities in the U.S. and is a popular destination for ghost hunters. On this 90-minute walking tour, visit 10 of the city’s haunted sites and learn about the unmarked graves that lie beneath visitors’ feet. 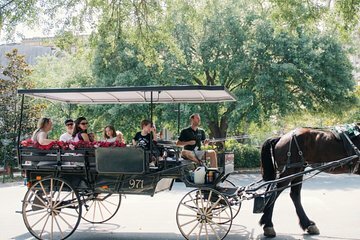 Then, at your leisure, take a horse-drawn carriage ride through the old part of town to learn more about Savannah’s past and enjoy views of moss-lined streets, churches, and historic homes. For the walking tour at 8:00pm : Please go to Cool Savannah Tours and Gifts located at 42 East Bay St (right beside the iconic Cotton Exchange. For the Horse and Carriage tour: Please go to 2 West Bay St, the Hyatt Regency Hotel (only 1 block west of our store). The walking tour ends at Colonial Cemetery.